I threw up a metal ball again and again. 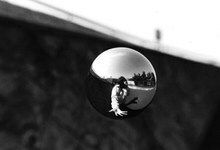 Tossing up a metal ball again and again along the river, in the streets, or on a train I shot this film frame by frame like an animation. Here comes ‘a little planet’, like a Zen question asking you what it is that you see.